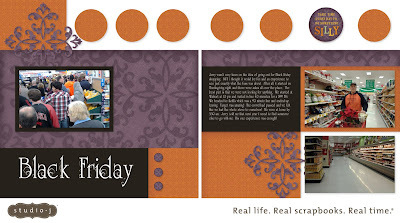 I have another Studio J layout to show you today recapping our Black Friday experience. There is not a lot of "extra" on this page as I let the journaling and pictures speak for themselves. Poor Jerry - that is a picture of him in Target at 3:00 am!! Come back to visit me later this evening. I'll have my newsletter done, and you'll see the fabulous Stamp of the Month and special for December! I love that you scrapped about this! Wow, great layout, great subject!